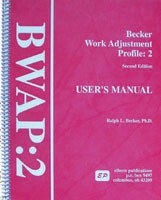 The Becker Work Adjustment Profile (BWAP) helps evaluate work habits, attitudes, and skills important for job readiness, work adjustment, and job employability. It may be suitable for workers and trainees who are physically, intellectually or learning disabled, have a mental health diagnosis, or are economically disadvantaged. It is a fast, reliable, and valid rating scale to determine vocational competence of people in Residential Developmental Center, Sheltered workshops, Work Activity Centers, Habilitation Centers, and Work-Study Programs in schools. The materials for the BWAP are a Questionnaire Test Booklet, an Individual Profile Form that has a Score Summary and Vocational Competency Profile, and a User's Manual. Each of the behavioral items in the Questionnaire Booklet describes an easily observed work activity. The rater simply circles the numeral that best describes the individual's behavior. The rater is someone who is familiar with the daily work behavior of the person being rated. Evaluators rate individuals using the following job behaviors: Appearance, Punctuality, Motivation, Attendance, Dependability, Personal Relations, Cooperation with Supervisors, Cooperation with Co-workers, Trustworthy, Accepting Correction, Emotional Stability, Helping Others, Changes in Routine, Managing Money, Following Verbal Instructions, Learning Job Task, Judgment, Knowledge of Work, Work Quality, Work Productivity, Independence, Attending to Task, Work Steadiness, Work Safety, Manual Skill and much more. Evaluators use the Score Summary to record raw and derived scores for each domain and global score. User-friendly Guidelines quickly convert these values to interpretable levels of work placement and work supports. Can be administered and scored in 20 minutes of less. The focus of Work Supports is to inform evaluators of what practical assistance or aids a person with disabilities may require to be successful at a job. The BWAP:2 work supports tells evaluators which of the domains may require the most supports and identifies the level of supports that are needed. Support Needs are listed in the manual from least supports to the most as: Limited, Low, Moderate, High and Extensive. The Vocational Competency Profile may aid the evaluator in providing a person's vocational competency in one of five work placement levels. These are listed in the manual as: Day Care, Work Activity, Extended Workshop, Transitional Sheltered, and Community competitive.